Book Series that we love: Our (current) favourite Chapter Book series! Text as well as illustrations – a great black and white wall of text was just too intimidating for a young reader. 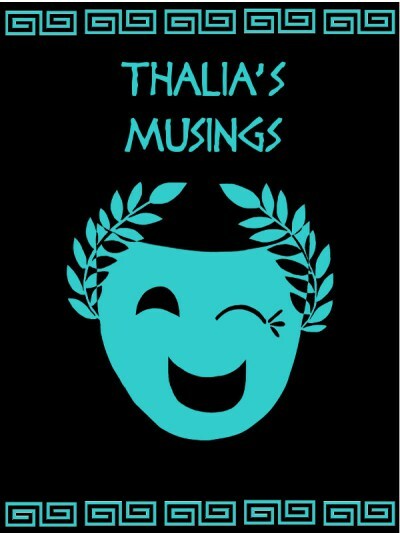 Fictional subject matter that involves intelligent young male heroes, fast-paced action and a little bit of cheeky humour. Factual subject matter of the slightly yucky kind. 1. 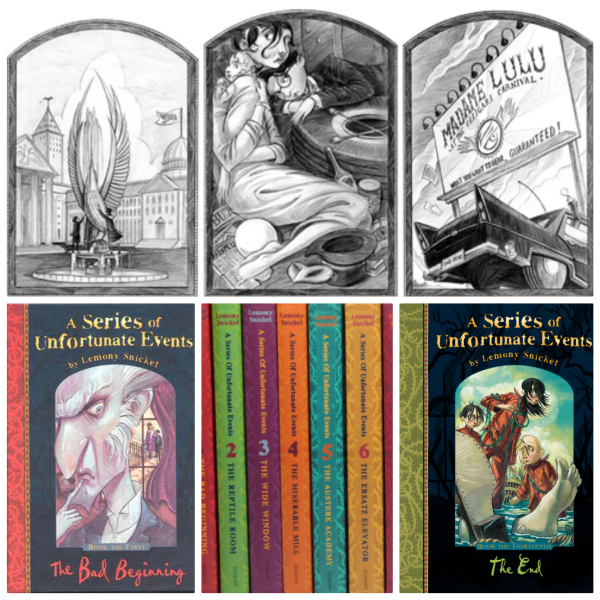 A Series of Unfortunate Events by Lemony Snicket This is a series of 13 books, each with 13 chapters, following the melancholy adventures of the three Baudelaire orphans, Violet, Klaus and Sunny. The books trace the lives of the Baudelaire orphans as they pass through various foster homes before going on the run from the police, whilst being pursued by a self-proclaimed ‘distant relative’, Count Olaf, who is bent on acquiring the Baudelaire’s considerable inheritance. Along the way, they uncover the mystery surrounding their parents’ deaths and encounter all manner of exciting things like secret organisations, venomous snakes and delicious pasta. The author, Lemony Snicket, is as much a character in the books as well as their narrator and commentator – and his satirical humour is evident throughout the novels, often warning the reader that very few positive events take place in each book and even suggesting that the books be discarded in favour of more cheerful pursuits. The stories are accompanied by beautifully detailed black and white illustrations by Brett Helquist which are Victorian in style and add to the gothic nature of the books. The pictures often hold clues as to the true nature of people and events in the story that are not fully described in the text, and this adds an extra dimension to the books as the reader has a chance to play detective (which J thoroughly enjoyed). Mummy Guide: These books are extremely well-written but the subject matter is a little bit on the morbid side, so if you have a particularly sensitive or anxious young reader then proceed with caution. Additionally, binge-reading these books is not recommended as you will feel miserable at the unfairness of it all. However, the underlying theme of maintaining a courageous and positive outlook in the face of adversity as well as the concept that moral decision-making is not always straight-forward are both great learning points! 2. 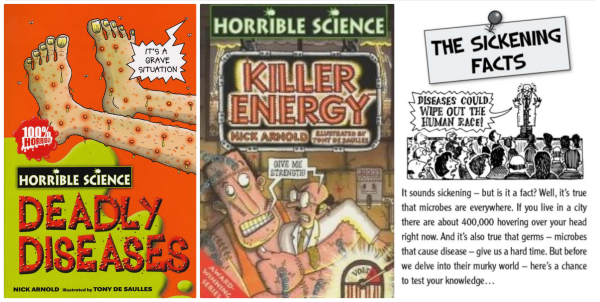 Horrible Science by Nick Arnold The Horrible Science books are basically little encyclopaedias covering a variety of science-related topics from physics, chemistry and biology, often in gruesome and disgusting detail. Every page is peppered with silly jokes and hilarious cartoons by Tony De Saulles which make each book a fun and engaging read – so it’s absolutely perfect for kids who are still entertained by toilet humour (which is all kids, really). J loves these books because they help to answer all his questions about the world and provide him with plenty of subject matter for creeping out his classmates. Mummy Guide: These books are not afraid to be yucky and gross (because science is often messy) but there are no sexual themes or gratuitously written descriptions of gore. 3. How to Train Your Dragon by Cressida Cowell This is definitely our current TOP favourite chapter book series not only because the books are such an entertaining read and have dragons in them, but also because the main protagonist is one of the best role-models we have ever come across. (Did I forget to mention that there are dragons in these books?) At the moment, there are 11 books in the series, with the twelfth (and final) instalment due to be released in September of this year. The books are set in a fictional Viking world and record the experiences of Hiccup Horrendous Haddock the Third and his tribe of Hairy Hooligans. The books generally deal with various aspects of the Viking Instructional Programme which also involves the capture and training of both small hunting dragons as well as larger riding dragons. This inevitably leads to Hiccup, his puny hunting dragon, Toothless, and his asthmatic best friend, Fishlegs, getting into some awful (and life-threatening) misadventure. As the books are meant to be the memoirs of an elderly Hiccup looking back over his young life, they are full of funny annotations, notes about dragons and crudely drawn sketches of various characters. Mummy Guide: The books do involve quite a bit of violence (eg. sword fighting, hunting animals, people getting eaten by dragons etc.) but there are no graphic or gory descriptions. There’s also plenty of ridiculous potty humour of the sort that tends to appeal to little boys (eg. burping, farting, characters going through Advanced Name Calling training). However, Hiccup is a very well-written hero and his journey traces the struggles of his character as he grows into a good leader. One of the main themes of the series involves him having to make tough choices between what is right and what is easy, and through his actions, we can see the power of forgiveness, humility, compassion and loyalty. Update: MPH Bookstores Singapore has kindly offered to sponsor a copy of How to train your Dragon: How to Ride a Dragon’s Storm by Cressida Cowell to TWO lucky Owls Well readers! Hooray!! An account of how Pamela of TanFamilyChronicles teaches her young children about why the nation is grieving for one man. These thoughts about the impact that Mr Lee has on one woman in different stages of her life by yAnn of Yannisms. It seems inconceivable that the World should lose not one, but two of its geniuses in the span of a week. 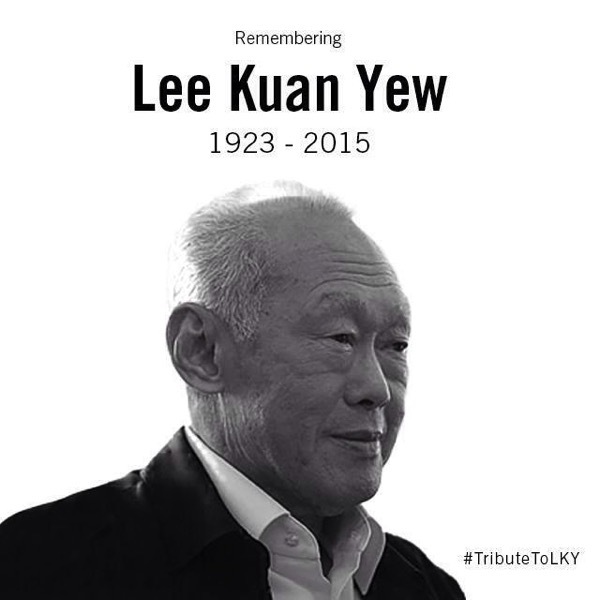 Yet, here we are mourning the death of Lee Kuan Yew, Singapore’s founding father and the last of the PAP’s first generation. Mr Lee is not known for his literary genius. He was a visionary, strategic thinker and politician. Still, he did publish his memoirs in two thick volumes – The Singapore Story and From Third World to First, so in the spirit of the Owls Well book month, I have decided to write a little bit about them. As I read both books in 2000, my memory of the books might be a little hazy, but I’m pretty confident that I may well be one of the very few people who have read them cover to cover. 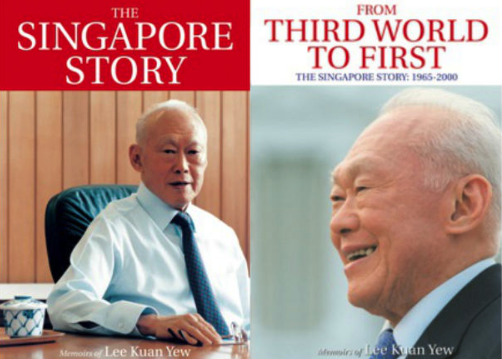 The first book, A Singapore Story, covers Mr Lee’s childhood growing up in rural Singapore, his young adult years as a University student in London and his early political career. Rather than a book about heavy politics, it’s more of a recollection of childhood and growing up, with a little bit of romance thrown in. It’s hard to imagine Lee Kuan Yew as a young man picking mushrooms at a golf course and making omelettes with them while courting his wife-to-be, yet the memories are still there, pinned to the page like so many butterflies in a collection. It’s equally difficult to imagine him as a glue manufacturer and salesman, but apparently, Mr Lee supported himself during the Japanese occupation by making Stikfas glue (he even provides his readers with the recipe for it!). It’s not a poetic book by any stretch of the imagination, but it’s informative, giving a glance at the man who would later become Singapore’s driving force. Lee Kuan Yew only really gets to the meat of the politics of Asia with his second set of memoirs, From Third World to First, (or as I like to call it: “Country Building 101: What to do with a bunch of really ornery immigrants who don’t have much direction and would really like the British to come back, kkthx”). The answer to this question is, of course, “Get Machiavellian” (e.g. Make serving in the army compulsory on pain of jail and also pain) and if that doesn’t work, “Make Stuff Up” (e.g. Ask Israeli army trainers to grow moustaches and call them codename them ‘Mexicans’ so that things stay totally top secret). One of the things I enjoyed the most about Lee Kuan Yew’s memoirs is simply seeing what his thought processes were in making his political decisions. There is no denying that the man was a political genius, and some of the things that he actually got away with were, frankly, inventive and funny. No matter how many of Lee Kuan Yew’s decisions boil down to getting Machiavellian or making stuff up, we cannot deny the results. Singaporeans currently enjoy a high standard of living and a the highest trade to GDP ratio in the world. Lee Kuan Yew gave everything he had to Singapore and the story he tells about the building process is fascinating, not just because of what happened, but also because of what may still happen in the future. Goodbye, Sir, and thank you. Sir PTerry is Dead. Long Live the Discworld. 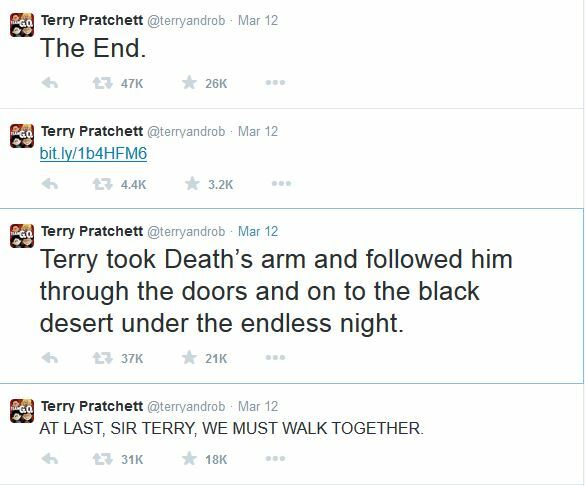 On the morning of Friday, 13th of March, the following messages appeared on Terry Pratchett’s twitter feed. …and I cried, because this meant that Sir PTerry, author of over 70 books, including the famous Discworld series, was dead. The literary world is all the poorer for his leaving this Earth so young. Terry Pratchett’s books have a special place in the hearts of his readers and in the hearts of the Owls Well crew. My personal favourites are Reaper Man and the books in the Tiffany Aching series. Debs favours The Amazing Maurice and his Educated Rodents and Men at Arms. The Boobook’s favourite books are Hogfather and Thief of Time. Even the Barn Owl has his favourites, The Colour of Magic and The Bromeliad Trilogy. It is difficult to put into words how much the Discworld series, and Terry Pratchett’s other work mean to me. Even now, as I type these words, I cannot help but feel tears streaming down my face as I recall how very alive he was as an author. His books always brimmed with energy. In his work, we could see our own world through a fantasy lens, realising the beauty in it while still recognising the terrible and awful things that needed changing. Back in University, I was able to attend a talk that he held in a small meeting room just off Darling Harbour. Though the room was packed, he still somehow managed to make his speech feel intimate and friendly. He spoke about having open heart surgery, about cosplayers at Discworld conventions and even chatted to a few of the cosplayers at the talk. After the talk, he sat down to sign everyone’s books and I remember asking him if he had any books about Chinese people. 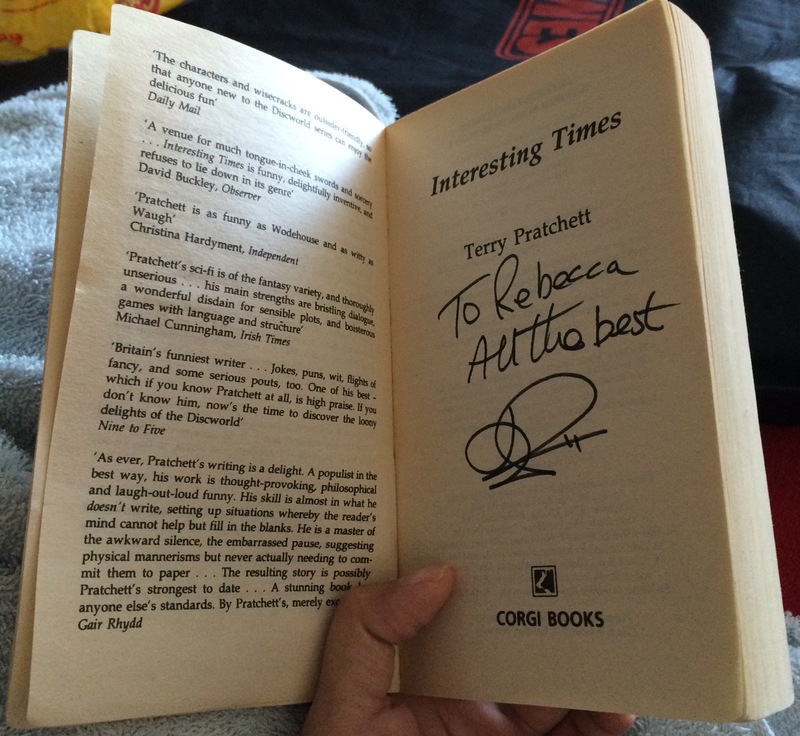 He said he did and handed me a copy of Interesting Times, which he signed with a flourish. A present from him to me, he said. I still treasure that book. Three days later, the announcement came that he was diagnosed with Alzheimer’s and yet he kept writing. Even after he could no longer read, he continued to write through dictation. Even now, after his death, there are still a number of books that will be published posthumously. Even though Sir Pratchett has gone, his books and characters will live on. And for that, we are grateful. One of the ways that I have been teaching J and Little E to read is through the use of books that are specially written for emerging readers. These are little picture books that use a controlled, repeated vocabulary, with one or two sentences on each page printed in a large and clear text. These easy-to-read books are great for helping kids to match spoken words with print and for building up confidence in reading. Although there are plenty of beginners books on the market, I find it rather difficult to find really good books that use natural language and contain engaging subject matter. However, when Armour Publishing introduced me to the homegrown Timmy and Tammy ‘Let Me Read’ series written by Ruth Wan-Lau, I was very pleasantly surprised to find that the books were not only beautifully illustrated (by Eliz Ong) and well-written but also appealed very strongly to Little E. At the moment, we keep the books at the Aged P’s house and they are her current go-to books. She is always bringing them to the Aged Ps to get them to read along with her! Part of the charm of the series lies in the fact that the stories are all set in Singapore and revolve around Timmy & Tammy’s adventures to popular local attractions such as the Botanic Gardens, Changi Airport and the Fire Station. Little E gets a real thrill out of pointing out familiar landmarks featured in the books and talking about cultural experiences mentioned in the books that are uniquely Singaporean. I am not at all surprised to find out that the Timmy & Tammy series was selected to be part of the SG50 Jubilee Baby 2015 welcome package! That means Baby #3 is going to receive a set later this year! Woohoo! A Special Something for Owls Well Readers: The kindly folk over at Armour Publishing are generously sponsoring a set of 5 Timmy & Tammy books to ONE lucky Owls Well Reader! Thank you, Armour Publishing! P.S. 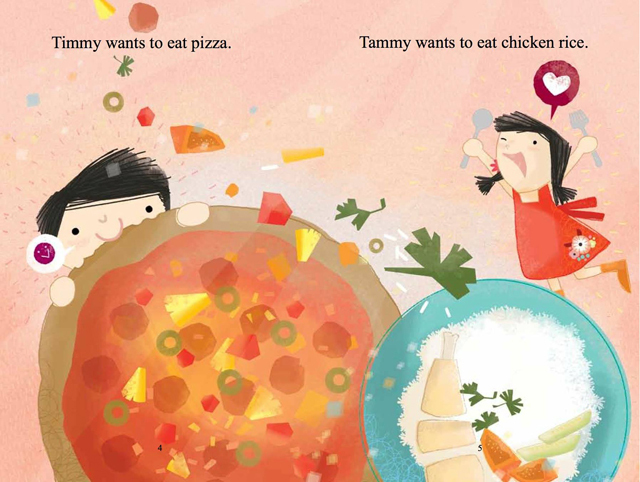 You can purchase Timmy & Tammy books at S$34.50 (for a set of 5 books) or S$6.90 each from Popular Bookstores, Amazon Website or from Armour Publishing’s Website. I am so glad to introduce this wonderful series of children’s books by my primary school chum, Melanie Lee, the author of Imaginary Friends! Yay! It’s so great to see brilliant work from local Singaporean authors! This book series revolves around Squirky, a little blue alien from Planet Q who is living on Earth with his parents and sister Emma. In the first book, ‘Why Am I Blue?’, Squirky realises for the first time that he is different from the rest of his family, and his parents reveal to him that he is adopted. The book deals very sensitively with the concept of adoption which is a subject very close to Melanie’s heart and provides a great springboard for discussion. I imagine that the books will be invaluable to adoptive parents who are looking for ways to gently and openly talk to their children about the subject. 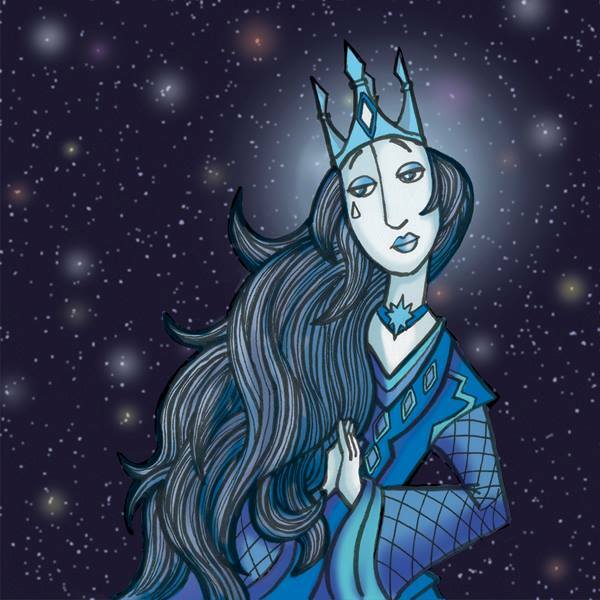 Melanie also includes links to useful resources about adoption as well as a very helpful FAQ at the back of ‘Why Am I Blue’ about the issues surrounding adoption which I found very informative. After reading the FAQ, I have a better understanding of the struggles and fears that adoptive parents go through when broaching the subject with their young ones, and I hope that I can be a better support to my friends who have adopted children. I was very surprised to find that both J and Little E identify very strongly with Squirky, as (coming from an interracial background) they already know that they are different from the people around them. When they look in the mirror, they are both very aware that their outward appearances are different from that of their classmates. This is something that Squirky has to deal with in ‘Why Am I Blue?’ and he learns that being different makes him unique, and that he is not alone in the world when he is surrounded by a family who loves him. 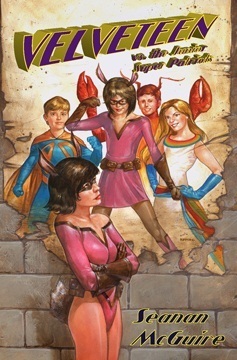 J and Little E were also intrigued by Squirky’s story, which bears many similarities to that of DC Comic’s Superman (whom both of them are familiar with). When Book #2 of the Squirky adventure series was released, J became very excited and could not wait to get home to read it to Little E! They were both captivated by the beautiful illustrations by local artist David Liew, especially his depiction of the beautiful and sad Queen Stella. In ‘What Happened To Planet Q?’, Squirky’s loving parents support his decision to search for his birth parents and find out more about his origins, so with the help of his sister Emma, he leaves his home on an exciting space adventure in the second book. The theme of this book is on the concept of honesty and openness in communication which is something that I am currently trying to impress upon my children. The truth is oftentimes hard and painful, and the reaction you may get from telling the truth may be unpleasant, and this is something that Queen Stella experiences when talking to Squirky. However, lying through omission can be even more hurtful! Squirky’s adventures continue in the latest addition to the series, ‘Who Is The Red Commander?’ and I have been very privileged to receive a preview copy of the book from MPH Group Publishing. 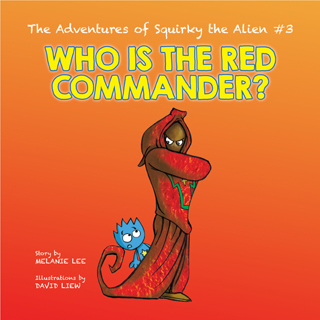 In ‘Who Is the Red Commander?’, Squirky and Emma land in the hostile environment of Planet R and bravely persist in their quest to find out about what happened to the inhabitants of his home Planet Q, meeting the mysterious and unfriendly Red Commander. In this book, both Squirky and Red Commander learns that facing one’s fears head-on can lead to forgiveness, personal growth and strength. I really appreciate the way that Melanie weaves difficult concepts and themes into all the books, providing many opportunities for discussion with my kids – and I can’t wait to see what she has in store for the rest of the series! A Surprise for Owls Well Readers: MPH Bookstores Singapore is very generously sponsoring a full set (Books #1-3) of The Adventures of Squirky The Alien by Melanie Lee to TWO lucky Owls Well Readers! Woohoohoo! Update: This giveaway is now closed and the winners have been contacted by email. Thanks for playing!